Comments: Arthur Raymon Thacker, shown above, was born on October 14, 1909, in Stuarts Draft, Virginia. He was the son of a miller, Arthur Lewis Thacker (1879-1956) and his wife, Eddie Bell (Cary) Thacker (1880-1950). 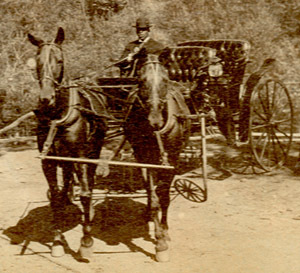 Raymon's father accepted a position with the Scottsville Flour Mill and loaded his family, including Raymon's older brother, Homer Dodge Thacker (1903-2006), onto a horse-drawn carriage to make the journey to Scottsville on May 6, 1911. Sara Elizabeth Thacker, the sister of Homer and Raymon, was born in Scottsville several years later. Raymon lived in Scottsville the rest of his life and was its funeral director, longtime Mayor, and Scottsville's savior from future flooding. Raymon passed away on Sunday, 21 February 2016, and is buried at Scottsville Cemetery. 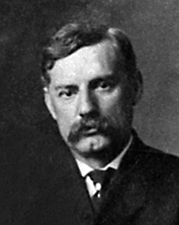 Raymon was preceded in death by his first wife, Emma Lou (Via) Thacker; a son, Arthur Raymon Thacker, Jr.; his brother, Homer Dodge Thacker, and wife, Beatrice (Davis) Thacker; his sister, Sara Elizabeth (Thacker) Kershaw, and husband, James. Raymon is survived by his loving and devoted wife, Arbutus May (Deihl) Thacker, and their son, Matthew Lewis Thacker and wife, Donna, all of Scottsville; his daughter, Virginia Lee (Thacker) Bishop and husband, Arthur, of Yorktown, VA; his son, Cary James Thacker and wife, Arlene (Napier) Thacker of Charleston, SC; and many grandchildren, great grandchildren, and great-great grandchildren. 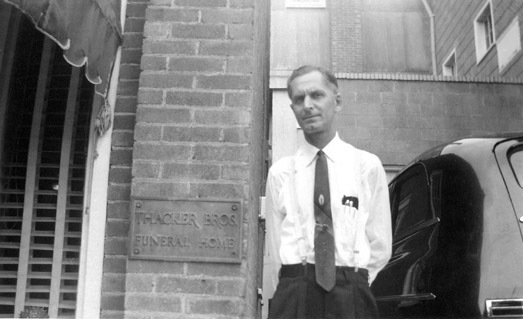 Raymon Thacker stands outside his beloved Thacker Brothers Funeral Home in Scottsville, ca. 2009. 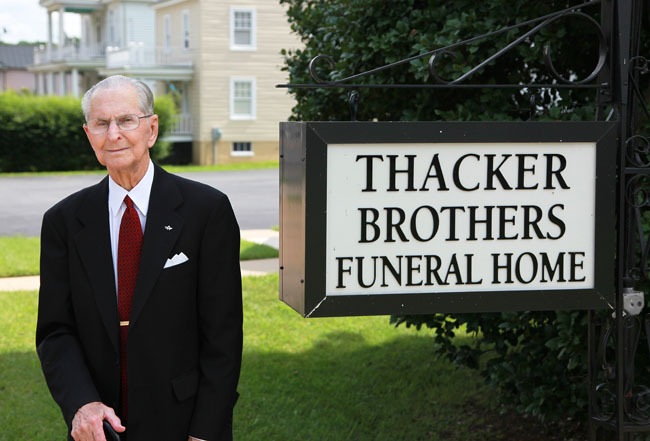 Raymon and his brother, Homer, owned and operated Thacker Brothers Funeral Home in Scottsville for 57 years. Raymon also served on the Scottsville Town Council for 6 years before being elected Mayor of Scottsville, a position he held for 30 1/2 years. As Scottsville's Mayor, he organized its Volunteer Fire Department and Rescue Squad, and the local Lions' Club. 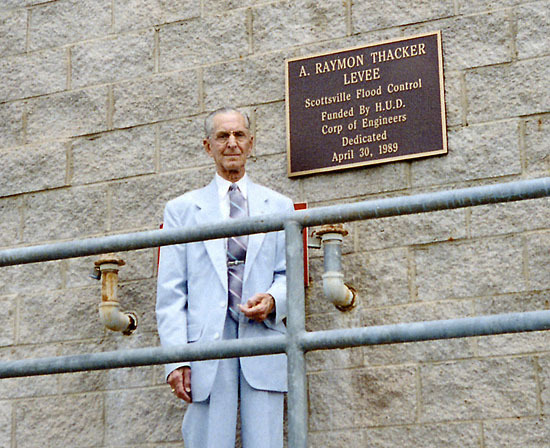 Raymon's legacy as the town's longest-serving mayor includes building a modern public water and sewage system in Scottsville; extending the town's boundaries so it continues to change and grow; and being the inspiration and persistence behind building the A. Raymon Thacker Levee that was dedicated in 1989. 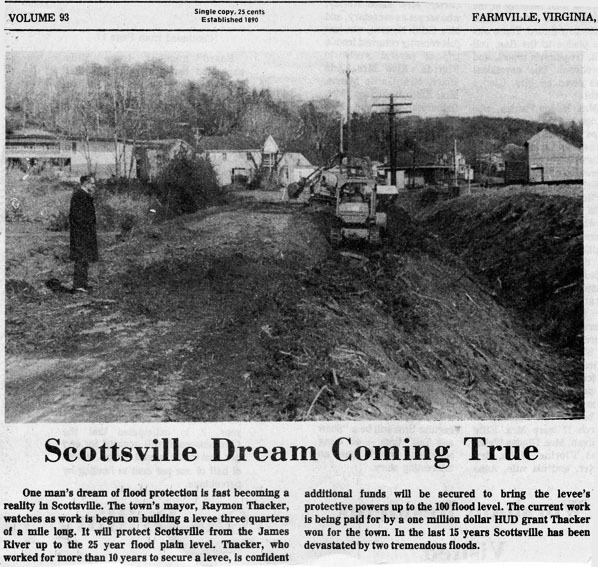 Since 1989, Scottsville has not been flooded, thanks to the Thacker Levee. Raymon also worked with the Tompkins family to acquire the old Disciples of Christ Church in Scottsville and immediately converted it to the Scottsville Museum and Historic Landmarks Foundation. 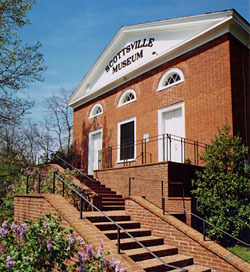 Working with Virginia Moore and Robert Walls, Raymon turned the old church into a wonderful Museum of Scottsville's history, dedicating the Museum in 1970. 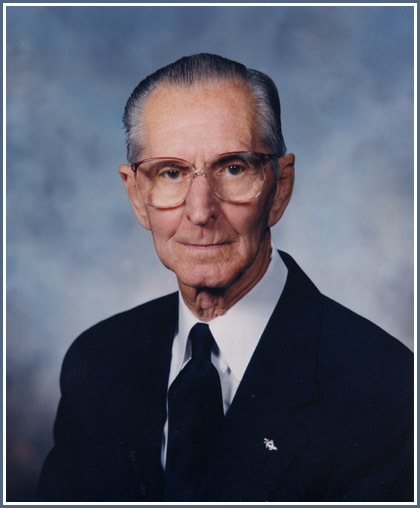 He served on the Museum's Board of Trustees from 1970 until his passing. Raymon's memory of Scottsville citizens and local events was remarkable, and he was always available to provide local history information including historical photos of Scottsville and its citizens. Thank you, Raymon, for your vision and stellar efforts to preserve the historic heritage of Scottsville! Former Scottsville Mayor A. Raymon Thacker – the man who saved Scottsville - died Sunday, Feb. 21, at the age of 106. Thacker, born on Oct. 14, 1909, endured. Like much of Scottsville with which his life is so entwined—the river bend, the occasionally flooded streets and beleaguered architecture, the home, lives, and the economy of the people he worked so diligently to secure-he endured. How can we believe he is gone? All Scottsville stands as his legacy. As the town continues to change and grow, it will be in large part because of his persistence, acumen, intelligence, and Southern, steely, charm, and on the most obvious results of that persistence, the enhanced town boundaries and the A. Raymon Thacker Levee. He was a story-teller, a raconteur who first engaged me with the understanding that, in listening to his tales, I was hearing — just second-hand, over a span of almost 150 years — the voices of Scottsville men who’d been in the Civil War. How can we believe he is gone? The story of his coming to Scottsville always begins the same way: wrapped in blankets, in his mother’s arms, arriving with his family by horse and wagon from Stuart’s Draft in 1911, when he was almost two. The streets in this telling are packed dirt; later he recalls ox-carts, the carbide lamps lit by the policeman each evening from dusk to 11 p.m., the ditches dug for the first public plumbing. His father Arthur had been hired as an expert to operate the new “state-of-the art” steam grist mill in Scottsville. 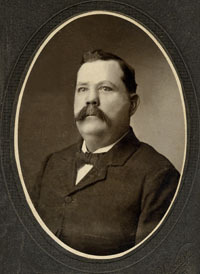 The elder Thacker was in charge of its operations from 1911 to 1918, when he took over C.R. Dorrier’s hardware store. 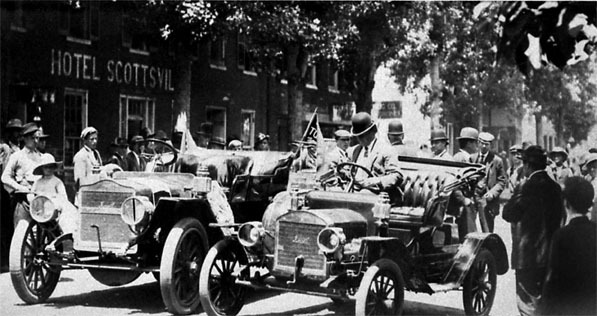 In 1911, Bill Woodson met the Thackers in Charlottesville for their carriage drive to Scottsville. The Thacker family stayed temporarily at Hannah Moore's boarding house on Valley Street before moving to the Stinsons' home. From the beginning, Raymon Thacker’s memory for stories and events, the everyday life of Scottsville, is remarkable. This remained true for decades: “Raymon is the one who can tell you,” another panelist demurs at the “Growing Up in Scottsville” presentation opening the Scottsville Museum in 1993; that’s also what many people answered me when I’ve asked for local history information. He always was there to tell us, remind us, fill in the gaps. 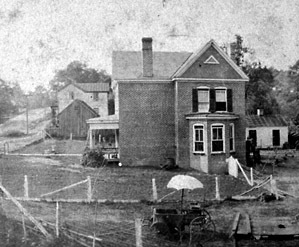 After initially being put up by Mrs. Stinson in one of Dr. Stinson’s house, the family, including younger brother Homer, began residing one house east of the Barclay House, on Main Street. This, Thacker said at the 1993 Museum opening, was one of the highlights of his life in Scottsville. He also listed as highlights Dr. Stinson’s two-seater red Maxwell, one of the first three cars in town, which he loved to see. The doctor thoughtfully stopped the vehicle when a horse passed. One day, told always to stay in the yard, the four-year old Thacker slipped out to the road when Dr. Stinson had to restart his car by cranking. “Father scolded me,” he recalled. Thacker cites as one of his most important influences, after his parents, Jackson Beal, Sr. Beal, grandfather of Scottsville's present mayor, Barry Grove, owned an insurance business and was Scottsville’s mayor for more than two decades, from 1905. He was travelling to Richmond in 1928 to lobby for the paving of Route 6, which Raymon said was then like a corduroy road: “shake you to pieces going to Richmond!” Thacker accompanied Beal several times and came face-to-face with the approaches necessary to move legislators, to get the town’s business done. By 1922, Homer Thacker had started the Scottsville Furniture Co., with its coffin sales. Raymon graduated from Gupton Jones College of Mortuary Science, part of Vanderbilt University, in 1929; he also attended Richmond Commercial Institute. Homer and Raymon both also worked at the Dorrier and Pitts auto company. Then Raymon and photographer William Burgess worked together for a while in 1931, establishing a successful funeral business with a $1,000 loan secured without collateral at James Dorrier’s bank, and using a Pauletts building on the north side of Main Street. “We were doing pretty well,” Thacker said. In 1933, Homer joined Raymon in the funeral business, and they bought Burgess out. “We continued and did exceptionally well, serving the whole community,” Thacker recalled; they moved their funeral home to upper Valley Street in 1965, started an ambulance service which was busy until the advent of the Rescue Squad. 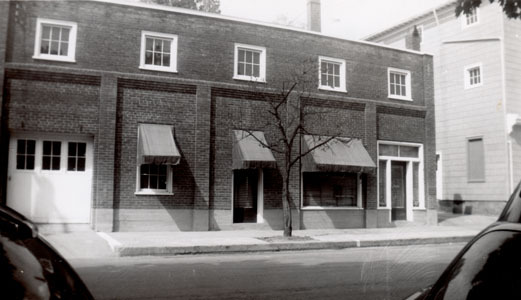 In 1936 Thacker joined with businessman Harold Parr to found the Scottsville fire department; in 1943, urged by banking friends in Charlottesville, he and other town leaders, Ellison Bruce and C.R. Dorrier, got 15 men together to establish a new Lions Club. That autumn, 1943, Thacker was instrumental in moving together land-owner, Dr. Stinson, and the U.S. Defense Corporation, who was looking for land for a rubber plant. It wasn’t automatic, as Stinson’s wife was against the idea of a plant that sounded possibly noisy and dirty, but Thacker knew how to apply pressure, carefully, in the right place, and by nightfall the arrangement had been made. If it had not gone through, the Defense Corporation men were going on to Nelson County in the morning. “I get myself pushed out into everything,” Thacker told me in 2009, when we spoke at the time of his 100th birthday. Raymon enjoys chatting with his siblings ca. 1960's. (L to R: Homer Thacker; Elizabeth (Thacker) Kershaw and her husband, Jim; and Raymon Thacker. Thacker’s career in the funeral business developed, he started the Scottsville Cemetery Association, co-founded the Scottsville Community Chamber of Commerce, became district deputy grand master of the Masonic lodge, and in 1943 was on Town Council. It was, he said, full of old men accomplishing nothing, and since he had his “hands full,” he quit after six years. But drinking water troubles plagued Scottsville, and in 1958 Mayor H. Reeve Nicholas, Jr., urged Thacker back onto Council. With friends in business, friends in politics (Thacker had met Winston Churchill and Dwight Eisenhower, and Virginia governors, Colgate Darden and William Tuck were counted good friends), Thacker could bring fresh influence and energy to town. Nicholas died in December 1965; Thacker took over his term of Mayor of Scottsville in January of 1966. He served in this position until July, 1996. 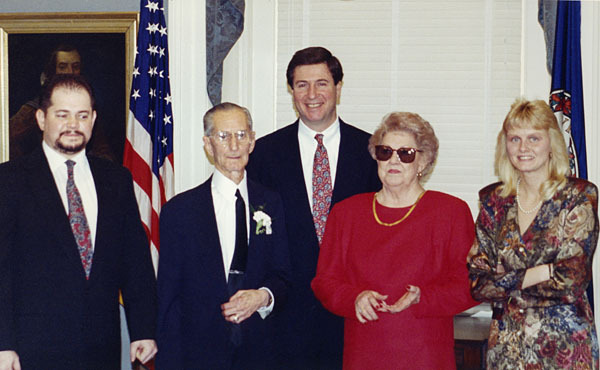 Virginia Governor George Allen officially recognized July 1, 1996, as "A. Raymon Thacker Day"
with a ceremony at the Virginia State Capital Building. His accomplishments began with a modern public water system for Scottsville, so drinking water would not have to be pulled from the James and highly chlorinated. Then came the disastrous 1969 and 1972 floods, tearing through the business district, “ruining the town,” Thacker still mourned. “It looked so bad.” Through his political network and many friends, “in came people [in 1969] from HUD—Health, Education, and Welfare—Small Business Administration, IRA, Army Corps of Engineers.” Thacker got the work assigned to the proper authorities, and with the help of Congressman Jack Marsh, got money for the cleanup. 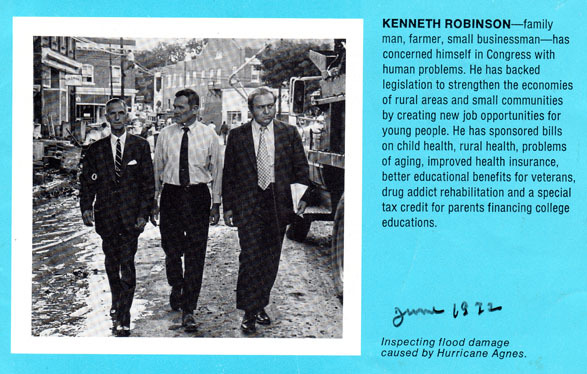 Scottsville's Mayor Raymon Thacker (left) and Congressman Kenneth Robinson (center) walk Scottsville's flooded streets after Hurricane Agnes, June 1972. Many businesses wanted to rebuild uptown, on Albemarle County land. To keep historic Scottsville from becoming a ghost town, Thacker put all his energies into protecting it from the James and giving it a good economic base. This involved connections, unexpected support, more persistence, a birthday gift from Albemarle of extended town boundaries to the north when he turned 83, and a massive amount of money, which Thacker raised with a dinner sponsored by Council to which “a lot of big shots” came, and with grants. 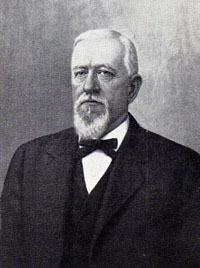 Daniel Van Clief gave 46 acres of land for the dam above the north end of Valley St., and downtown Scottsville was declared an Historic District so the value of 32 Federal-style and other important structures, protected by an Architectural Review Board, could be used as leverage for more money. Scottsville's Mayor Raymon Thacker watches as construction of the flood levee began in March 1983. Raymon stands happily in front of the completed A. Raymon Thacker Levee in April 1989. 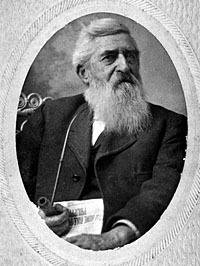 Raymon Thacker worked to establish a community college just north of Scottsville—again with the help of the governor and other important friends, and with Tom Bruce willing to donate the land; but after extensive efforts, he had to give in to Charlottesville’s desire to have the college. He has counted as others of his treasured highlights helping to develop the area’s 1976 commemorative bike route, and establishing a park in Scottsville. He helped start the Scottsville Museum, worked with the town’s 250th celebration of Albemarle County. 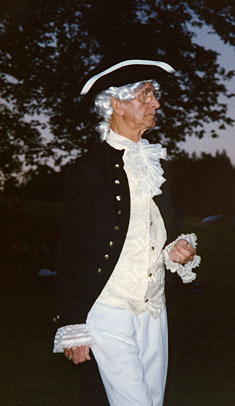 Raymon acting in Scottsville's 4th of July play ca. 1970s. 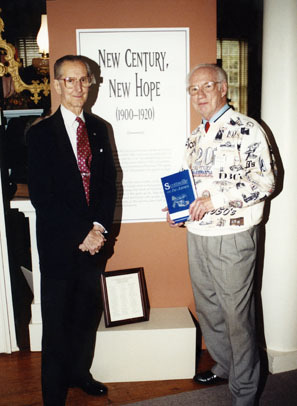 Raymon and Robert Spencer welcoming visitors to Scottsville Museum, 1999. But his memory stretched back so far, he also tells of enjoying the coming of Victory Theater to Scottsville, in 1918, the Chautauqua shows and famous entertainers, the later movies—three different shows a week in the 1950s. All 360 seats in the theater would be filled, he recalled, and the potbellied stoves burned red hot. Thacker also enjoyed his 100th birthday party, October, 2009, in the gym of the old Scottsville High School; I think I saw him kiss every woman there. It will not be easy to forget the Mayor, always so properly dressed, winter or summer, and his presence in town. He drove a big car, slowly, and carried a black brief case filled with memorabilia, though he confessed it was but a small part of what he had at home; he could show you a photo of himself and his wife, in New York City for a National Funeral Directors Association conference, accidentally but happily celebrating the end of World War II in the Astor Hotel (“Everybody went smack-dab crazy!”), or Daily Progress clippings on the 1976 election results. A. Raymon Thacker’s “down-home political skills” were praised by Peter Way as he presented Virginia’s and the country’s longest-serving mayor to the Virginia State legislature when it announced A. Raymon Thacker Day in the Commonwealth. But it’s Thacker’s memories, his active, interested attitude towards town, and his appreciation of Scottsville and its “wonderful people” that will seem equally important as we go on without him. “We’re in good shape now,” Thacker said in assessing the public water developments and flood control he organized in the 1970s and 1980's. Yes, we are.